Bonny began her teaching and coaching career in 1973 at Catalina High School where she coached varsity girls’ gymnastics until 1981. For three years she also sponsored the cheer/song-leading squads. While at Sabino High School in 1982, she began volunteering for Pima County Special Olympics. During that year she was appointed Arizona Special Olympics Gymnastics Sports Director and began training coaches throughout Arizona and serving as venue/competition coordinator for both Pima County and Arizona gymnastics competitions. In 1984 Bonny was honored as Arizona’s Outstanding Adult Volunteer. 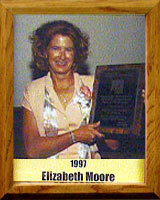 Upon her return to Catalina in 1985, she started a Special Olympics program for Adaptive PE students. Throughout the 1980s her teams trained and competed in bowling, gymnastics, power lifting and track and field. By 1995 her athletes were successfully participating in 99 sports and Bonny combined some of her team with athletes for ASDB. “Team Chaos” competed in basketball, team handball and floor hockey. In 1986 Bonny was appointed by Eunice Kennedy Shriver to the International Special Olympics Gymnastics Rules Committee. She served in this capacity at the 1987 World Summer Games at Notre Dame. After leaving Catalina in 1995, Bonny served Pima County as the Volunteer Area Director for Special Olympics.